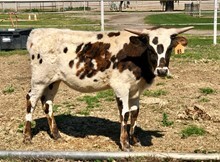 We would like to thank Warren and Cathy Dorathy for their purchase of this outstanding young bull. We think he is going to be great, and are happy to see him going to such a great program. Base 15.6250 09/30/2017 Horn Showcase Perris, Ca. Composite 168.0000 09/30/2017 Horn Showcase Perris, Ca. Tip to Tip 66.7500 09/30/2017 Horn Showcase Perris, Ca. Total Horn 70.0000 09/30/2017 Horn Showcase Perris, Ca.